Dr. Rahul Khare, founder of Innovative Care Express, 2400 N. Ashland Ave., recently expanded medical marijuana certification. LINCOLN PARK — Now that medical marijuana is being legally sold in Illinois, qualifying patients should be educated on what it takes to become certified to receive medical marijuana prescriptions. 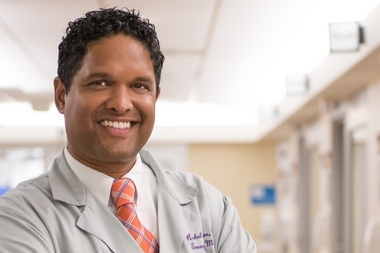 That's the reason Dr. Rahul Khare gave for recently expanding medical marijuana certification at his primary and urgent care medical clinic, Innovative Care Express, 2400 N. Ashland Ave., which opened eight months ago. Khare, who was a doctor at Northwestern Hospital for 11 years before founding his own clinic, said despite the recent advances in selling medical marijuana, many primary care physicians shy away from having a conversation about its benefits with qualifying patients. "There is a stigma. They feel like marijuana is an illegal drug, so you should stop using it. We've been taught this over and over again," Khare said. Another deterrent: Getting certified is a complicated process, he said. To qualify you must be an Illinois resident, suffer from one of the 37 listed debilitating medical conditions, receive a certification of your condition from a doctor with whom you have a bona fide patient-physician relationship, pay the annual fee to the Illinois Department of Public Health and complete a background check. The 37 debilitating conditions that qualify someone to participate in the medical marijuana program include cancer, epilepsy, severe fibromyalgia and multiple sclerosis. "There's a lot of paperwork and a lot of it is confusing," he said. To help make the process easier, Khare and his team have a conversation with interested qualifying patients about the benefits of medical marijuana and then help those patients complete the application process, step by step. Once the patient is certified, he or she can visit a dispensary in the city. Dispensary 33, in Andersonville, was the first to get its license in Chicago. Khare said the reason he started offering support for qualifying patients a month ago is simply because he's witnessed many patients feel better after using medical marijuana. "They come to you and they've tried to talk to their pain doctors to do something different but the physician doesn't help certify them," he said. "To see these patients take medical marijuana and then not have the dependency on the opiates ... that, to me, is a wonderful example and something we've seen happen." Khare said he's confident more doctors will start helping patients navigate the state process — it'll just take time. "We have a long way to go. This is how Colorado and California started. They had to start somewhere," he said. For everything you need to know about medical marijuana in Illinois, check out our handy guide.